SEPA accelerates its response to extreme flooding. Vodafone offers revealing insight into human geospatial movement. Severn Trent Water strengthens business performance by improving data quality; Cornwall Council pursues multi-million pound cost savings; Fugro steers clients towards successful off-shore developments; Award-winning story map transforms lessons into adventures. 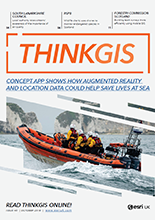 Europe's largest construction project is deploying Esri's ArcGIS platform to deliver new capabilities; Sovereign Housing builds a brighter future; North Wales Police safeguards communities with ground-breaking evacuation planning system; Wiltshire Council saves £275,000 with mobile GIS. NHS trust cures A&E pains with new insight into healthcare demand; What does GIS do; Share your enthusiasm for GIS; Scottish collaboration project paves the way for cost savings. Natural Resources Wales ensures the sustainability of protected cockle beds; Newham Council improves efficiency and clarity of schools admissions; St James Hospital pioneers 'geographic prescriptions'. Tullow enhances decision making with GIS; Garsdale Design accelerates 3D modelling for urban planning; GIS gives the UK's largest insurer competitive edge; and the Cabinet Office uses GIS to drive savings within government. Coal Authority unearths vast improvements in customer service; Aster improves management of assets worth £600m; An interview with Jack Dangermond; SELB tackles truancy in Northern Ireland.